Val Gardena is one of the busiest skiing valleys in the Dolomites and for good reason, with a system which is well organised, extensive to say the least, not to mention some fantastic runs. 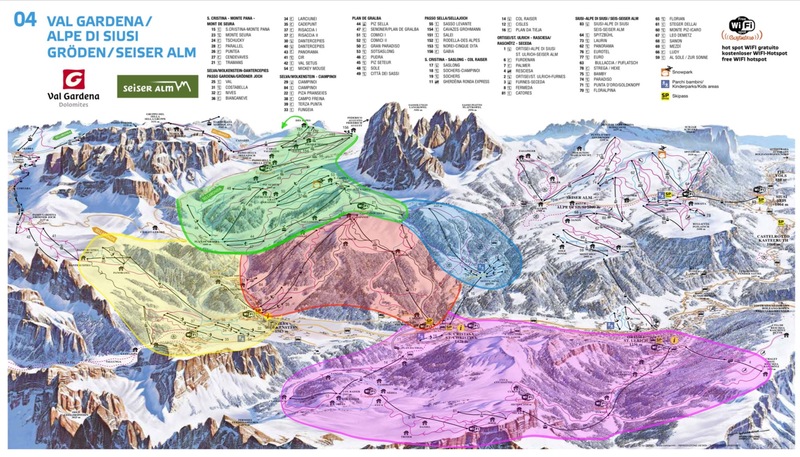 It links easily into Alta Badia, Val di Fassa and Alpe di Suisi with a network of lifts, buses and train links. What’s more, the villages are beautiful, have a great many excellent restaurants and a huge offering in terms of hotels. If there can be any criticism, it would be that it has lost its originality and a little of its charm as the tourism industry has done its stuff. Each provides a days skiing in their own right, before you even start linking one into the other. This is one of my favourite areas in the Dolomites; there is a mix of mainly easy and intermediate runs in utterly breathtaking scenery, well served by huts and lifts and I have been to some resorts which offer in their entirety as much as this one sector alone, especially when you consider that in reality the Selva Gardena and Monte Pana areas are in reality one with this. The reason I’ve split them is purely as its too much to write about in one chapter! 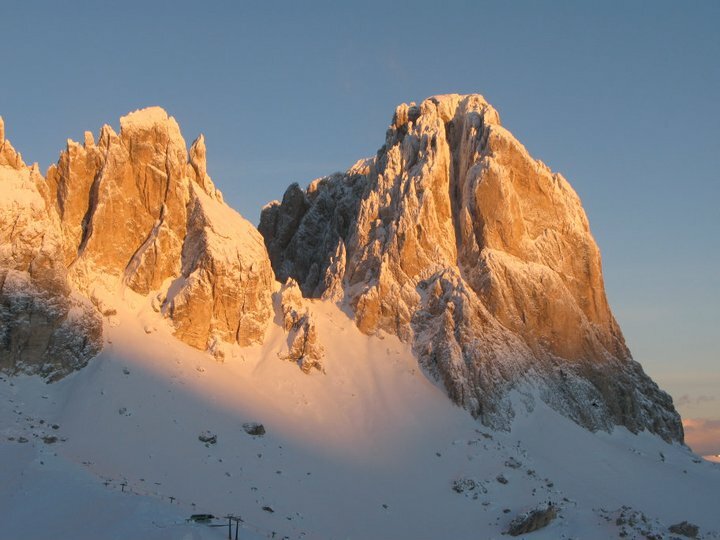 From Casa Alfredino, the easiest way to access the area is to drive for about 25 minutes over Passo Fedaia when it’s open and to park at Campitello di Fassa. 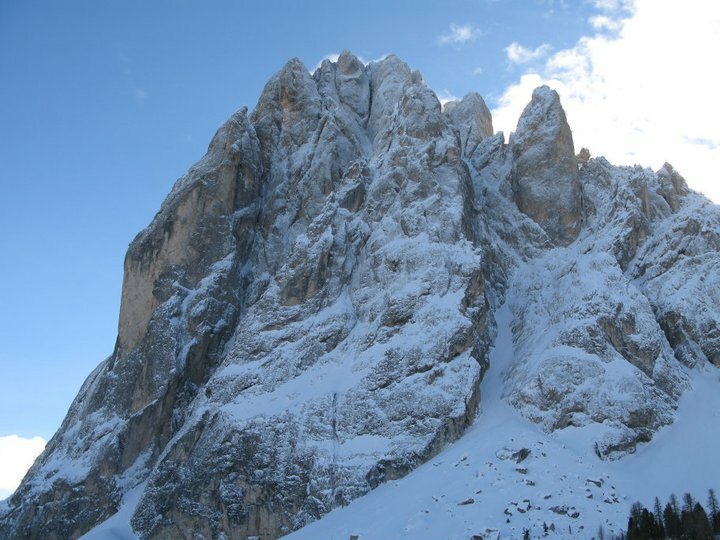 Alternatively you can drive (if you have a Dolomiti Superski pass) to either Lupo Bianco or directly to Sella Pass. From Campitello a cable car whisks you directly to Col Rodella, the top of the range. In this part of the world Col means hill, so you are deposited more or less at the summit of a mountain which affords immense views of Sassolungo, Sass Pordoi, Marmolada and south to the Fassani mountains. From the treeless runs at the pass one can take an enormous and very easy uninterrupted run all the way to Selva di Gardena. It’s great for beginner skiers, but I wouldn’t recommend this for snow boarders as there are quite a number of flats spots and instead there are a number of easy deviations you can make, to either make this longer or more difficult. From Casa Alfredino, the easiest way to access the area is to driver or about 25 minutes over Passo Fedaia when it’s open and to park at Campitello di Fassa. From here a cable car whisks you directly to Col Rodella, the top of the range. In this part of the world Col means hill, so you are deposited more or less at the summit of a mountain which affords immense views of Sassolungo, Sass Pordoi, Marmolada and south to the Fassani mountains. The opening run from here is truly great – it could just be longer! It drops quite steeply, although if you pick an outside line can be skied by less able skiers quite comfortably – it’s bark is certainly worse than its bite. For those keen on side country, head just to the left of the return chairlift and tackle the excellent and steep run down beneath the lift. The first time I discovered this, there was deep powder and I spent a quarter of a day just going up and down that section on its own taking different lines. At the bottom of this slope be careful. If you have only bought a single area ticket, don’t ski down into Val di Fassa as you won’t be able to get back up from Lupo Bianco. 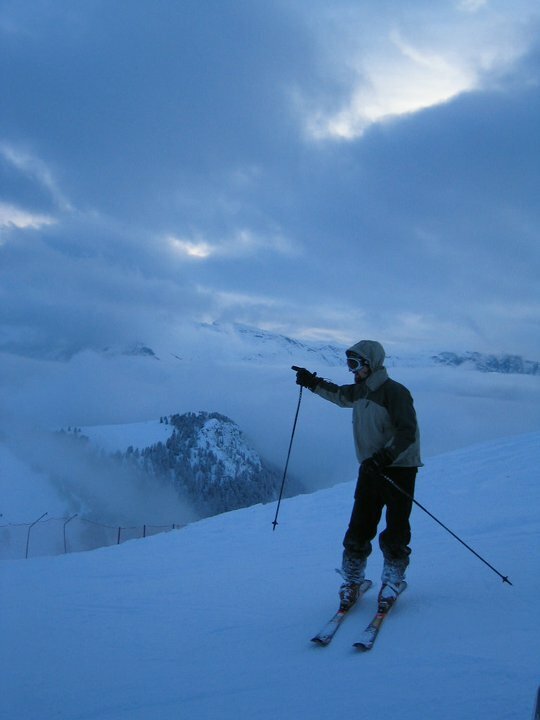 Instead, there is a short lift which delivers you back to some slopes just above the Sella Pass. From here swoop down past the grandiose new 4 star hotel at the pass (excellent food if you’re there about at lunch) and past a small hut on a long and flattish blue run. Make sure you keep up your speed on this section as it can be a long walk if you don’t and take care of your snowboarding buddies. It leads down into the woods and to a short lift up leftwards. Here you can either continue on the blue down to Plan di Gralba, or take the lift which opens a variety of possibilities. Indeed if you pile out and ski back down the line of the lift, shortly bearing left, you will find my favourite red of the entire resort, Falk. Given heavy snowfall and low visibility, the contrast provided by the trees makes this into a deserted quasi off piste paradise! Even in more normal conditions, this rolling run, with its steep sections broken by nice breaks is just good fun. Jump back on the cable car lift to the top of Piz Sella and you have access to the meat of the sector. The black you’ll find at the top here if you leave the right hand side of the lift house, is steep and narrow and often icy. Not for the timid, and in my opinion just not that good. Better, take the red or black to your left which gives really wide sweeping runs back to Plan do Gralba. In the bowl at the bottom of the first section there is an excellent restaurant, Rifugio Comici with different levels of culinary excellence at different price tags. Indeed this bowl is somewhat of a playground. Usually bathed in sunshine until the early afternoon, these runs are dwarfed by the mighty walls of Sassolungo, and there is a snow park, and often timed courses, or slalom runs. It’s packed full of easy blues. Lastly, from Rifugio Comici, there is a little known run which heads over the pass down towards lift 21. This is a special run, as you ski right beneath the North Ridge of Sassolungo which is quite one of the most impressive places you can ski in these parts as it towers some 1000m above the screes. It also links to Monte Pana and can provide some fun skiing through the trees. The huge Sassolungo North face from Mont de Seura, in the tucked away Monte Pana ski area. I’ll quickly talk about the small area at Monte Pana – it’s worth a trip as there are some nice runs there, and it also provides access to the back of Alpe di Suisi. From the bottom of lift 21 simply continue along the easy and in places flat blue. This brings you shortly to a bowl in the shadow of Sassolungo. If you aim to get to Alpe di Suisi, head to the car park where you will find a bus stop – usually they leave every half hour or so. It’s a great trip along a back country lane – the buses are equipped with huge snow chains and the road is absolutely not navigable normally. It’s a really nice outing and can be made into a tour. I’ll write another blog sometime detailing it. But back to Monte Pana. There is an area of blue runs served by ski tows, probably only of interest for larking about or letting the kids loose in a small area on their own whilst taking a break yourself. However, take the lift back to the top of Mont de Seura and you will find two superb runs back down through the trees, a black and a red. They are often pretty much empty as this is a bit of a back water and a little tricky to get to, but well worth the effort. When you want to return, take the lift up to Mont de Seura and return to lift 21 which gets you back into the previous area quite quickly. So, the last area on this side of the valley is utterly fantastic. You can either access it by skiing all the way down to Selva di Gardena on the return run, or from the top of lift 21. I will describe the later as I suspect it will be the most interesting for our guests. The ski map is a little confusing here and could really do with some arrows to help you work out what’s up and down! So, take the run down from 21, or join it using the previously mentioned tricky black from Piz Sella. This is sometimes a little bumpy, especially as the day progresses. At the bottom there’s a nice little hut for lunch. Continuing from here will return you to Plan do Gralba. Instead take the lift just uphill of the hut, no. 22 which takes you up to Ciampinoi. Here the fun starts. This is an extremely busy area and it’s easy to lose each other, so come up with a plan before you start. In front of you you will see a steep “end of the earth” black – great for those looking for a short challenging slope with a long run out. Right, a flat link leads across to the other piste, in particular the famous Sasslong, which is used every year during the FIS season as a downhill run. Indeed as you schuss down the first drop, think about the racers straight lining this section and reaching 100kph along the relatively flat section. The Sasslong is quite possibly the most fun black I’ve ever skied. It’s not desperately steep at any point and rolls and winds it’s way down the mountain. Try skiing it in one go and your legs will be on fire during the steep sections with just enough rollers to give you a rest. Invariably when you get to the bottom, you will be dismayed by how slow you were compared to last years winners whose time is posted above the arrival arena. High above Val Gardena, spotting the way to the trees! Ski down the slope towards Selva di Gardena and you will find a red and a black run. Both of these are excellent. The red splits, one going towards Plan do Gralba and lift 22, the other rejoins the black further down the mountain. Both these runs are great fun, my preference being for the one to Selva which is steep and twisty. Indeed, the black is only slightly harder. It’s a very quick route down and puts you in a position to go towards Passo Gardena. The final alternative from Ciampinoi is a red which descends beneath lift 22 – be careful with this one. It is narrow, exceedingly busy and because of its shape allows snow to build at the edges in quite large moguls. It is quite normal to see beginners and intermediates spread eagle across the slope, and descending at speed will land you in trouble. The aforementioned return to the bottom of 22 in my view is a much better way and is far less frequented. Unless it’s early in the morning I’d avoid it. Let’s pick up in Santa Cristina in the Sasslong arena. As previously mentioned, here you will find a train link housed in a larch clad building which will take you up hill to a bubble lift. Seceda is great for easy, sun drenched skiing with grid views. It’s not stellar skiing, and because of its sunny position often softens up considerably in the afternoon and snow cover can be a bin thin in a dry year. That said its less busy and is worth a visit. It allows you to ski over to Ortisei where you can link by lift to Alpe di Suisi as part of the Hexentour. Fro Col Raiser, a short linking run takes you leftwards to a further chairlift takes you to the top of Seceda. To access Ortisei, facing downhill ski right wards where you will find a red valley run. It curls around the mountain through the trees. It’s long and pleasant with little requirement for a break as its a pretty easy red. You will pass a cable car house which allows you to return to Seceda if you wish or continue all the way down to the town. I’ll save how to link to Alpe di Suisi for another day. If you want to return to Santa Cristina simply follow the reds back downhill beneath the chairlift. Be careful about side country around here – it may look silky smooth and thick but it’s often just a skin which will leave you with a repair job that evening! It’s been a long blog so far – keep with me for this last area as its a good one! Having arrived in Selva Gardena from Ciampinoi, you will ski pretty much into the centre of the village. Take your skis off, walk over the road on an overpass and you’ll find a sneaky lift hidden behind some buildings. This is only a short lift which delivers you to the Dantercepies bubble cars. This in turn takes you to the top of Passo Gardena. 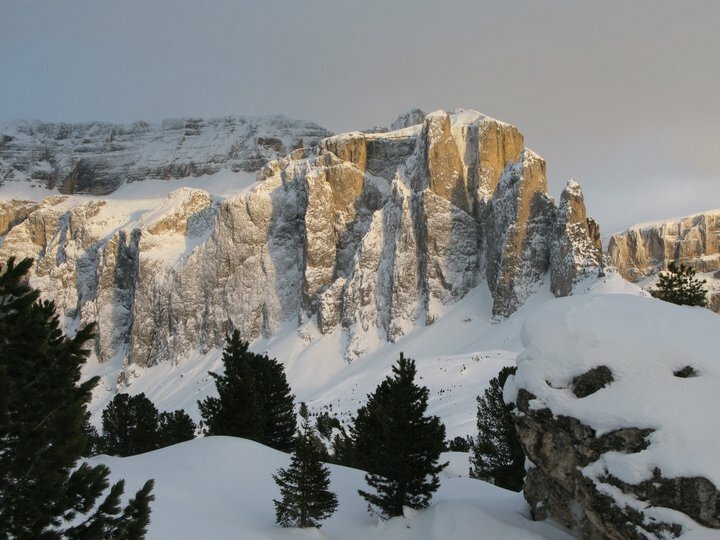 Check out our blog about Alta Badia to learn about the far side! If you want to return to Selva, there are three runs; a blue, a red and a black. The blue is a long easy cruise, great for tired legs at the end of a day, or beginners who want to see the sights at the top. The red is a little harder than the blue and indeed it joins it two thirds of the way down. Not many steep sections, although the ones there are are quite fun. But the stand out for me here is the black which takes the line to the furthest right. It has some good, sustained steep pitches and is by far the most interesting run of the sector. Great as part of a Sellaronda in the green direction! Be careful – this is a HUGE area and it is easy to get carried away and end up at the far end of the range, stuck. It’s an expensive taxi ride back! Set yourself a cut off time when you need to head back. From Ciampinoi it takes a good hour to get back, so you need to get on the lift in either Santa Christina or Selva Gardena most likely 1.5 hours before the last lift to make it back before they close the slopes. The lift down from Col Rodella is the easiest way to return to Campitello, although you can ski down the valley run to Canazei. I’ll explain in a minute. So, leaving Ciampinoi, ski down towards Selva for a few yards then take the red to the right to Plan di Gralba. Take a small chair no 45 back to Piz Seteur, then a small blue linking run (skiers lift, passing diagonally beneath a chairlift) to lift no 49. This takes you to a very flat blue – it’s not at all ideal for snowboarders so make sure you get speed up out of the lift station and DONT stop or catch an edge. It’s a long trudge at a critical time of the day! This will take you back to the Sella Pass.